Detroit still has a long way to go to catch up in size to some of the huge cars built in the past. 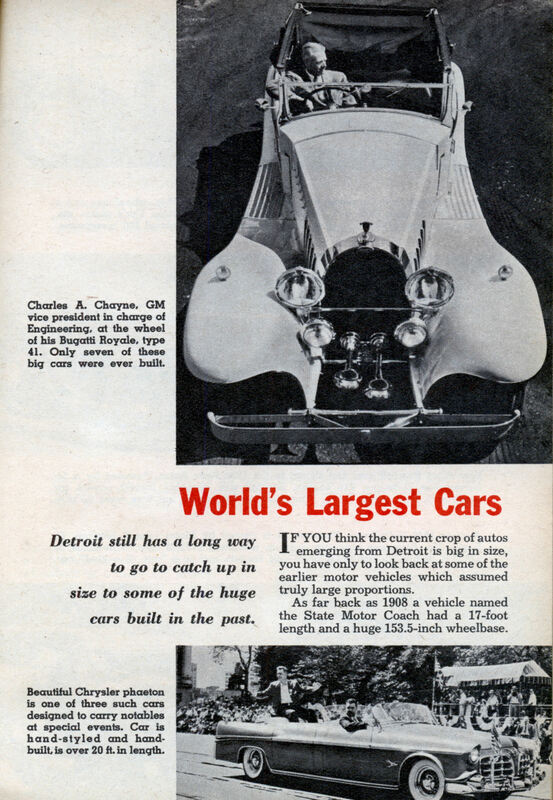 IF YOU think the current crop of autos emerging from Detroit is big in size, you have only to look back at some of the earlier motor vehicles which assumed truly large proportions. As far back as 1908 a vehicle named the State Motor Coach had a 17-foot length and a huge 153.5-inch wheelbase. Compare this with the 1957 Chrysler which is considered a big car today. Its wheelbase is a mere 126 inches. The latest Chrysler phaeton with its plus 20-foot length and 147.5-inch wheelbase is one of the few cars that matches its predecessors in size. In the roaring ’20s the Packard Twin-Six model 905 with a V12 engine and 142-inch wheelbase satisfied the yen of those who liked them big. The ’30s saw such powerhouses as the 16-cylinder engine of the Bucciali and the austere length of the $17,000 Rolls-Royce Phantom III. Detroit still has a long way to go to catch up in size to these behemoths of the past. what a beautiful car……..it is possible as it is car make?